Why Use TopSolar Find out why thousands of Americans use us when going solar. Saving Tips Discover the multiple benefits of consuming green energy. Solar By State Click on your state to read about tax incentives and more. With TopSolar.com, you can find and compare the best solar energy companies in your state. 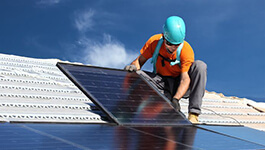 We’ll do the hard work of comparing and connecting directly with the top solar providers in your area. Use energy that will naturally replenish. Power your home & appliances with nature's light. You could save up to 40% on your energy rates. Solar power systems have become more popular over the last few years. With a single panel, a homeowner can reduce their utility bill by around 40%. There are multiple solar panel options available in the market. But to find the right provider that generate power for your household needs. We can guide you through this process. Read more in our beginner's guide to buying solar panels! Depending on the state you live in, you can apply for government subsidies, and if none is available, by financing. The U.S. Environmental Protection Agency (EPA) offer tax credits that could decrease the cost of your solar installation even more. On top of that, studies show average savings of $20k over 20 years. This means that your solar panel pays for itself in the long term. This means that your solar panel pays itself, in the long term. Now is definitely the time to start considering a renewable energy source for your home. With TopSolar.com you can find and compare the best solar energy companies in your state. We get you in touch with top providers so you can request your free quote online in seconds, no credit card needed.